Want to connect with Henrietta? 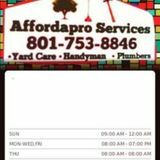 Affordapro Services is a full service specialty & basic handyman PLUS service. The PLUS means plus yard care, light plumbing, electrical and a partner cleaning service. Affordapro services offers skilled handyman who speak English. Most importantly, they get the job done right. Our handymen come from diverse backgrounds as journeymen, professional salaried contractors, businessmen and more. We have 20 years experience as the power force company. Affordapro Service employees go above and beyond the call of duty every time. Reliable natural caretaker, intuitively intelligent, loves pets and enjoys housesitting. Stop paying too much for handyman and construction work! Our guys are background checked and THE BEST!